Thundershirt --Drug Free solution for dog anxiety- barking, whining,crating anxiety,separation anxiety Thundershirt’s gentle, constant pressure has a dramatic calming effect for most dogs if they are anxious, fearful or over-excited. 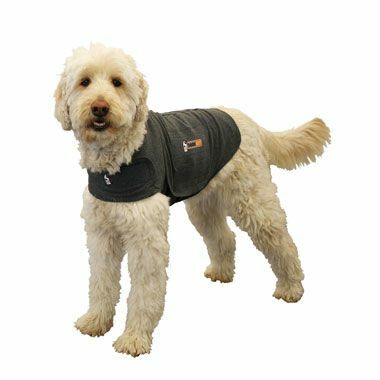 Based on surveys completed by over two thousand customers, over 80% of dogs show significant improvement in symptoms when using Thundershirt. Please order size by measuring around the largest part of your dog's chest and not by weight. Mickey's Pet Supplies has all the sizes available and ships for free within the U.S. This is guaranteed to work or your purchase price is refunded. Call us at 877-863-5431 to order today. Spring is around the corner and thunderstorms are a big source of dog anxiety.